Is it possible to beat the bookmakers at their own game and win money over the long-term by betting on horse racing without any knowledge of the sport? Does betting using purely a pricing edge really lead to success? Find out in the Pursue FIRE | Full Guide to Each Way Betting! While a big part of getting your financial house in order is undoubtedly managing expenses and saving more, the flip side is, of course, to find ways to earn more. Outside of traditional means, such as your day job, we need to look for some side hustles with earning potential. I always encourage people to pursue side hustles wherever possible. You never know where they might lead and anything that can diversify your income is a good thing in my book. I’ll talk about some of my other side hustles in future posts including the simply amazing Merch by Amazon (MBA) programme. For the purposes of this guide, however, I want to walk your through betting on horse racing….. 😮 okay you can stop laughing at me now. I’m serious! I also maintain a page that shows live results achieved since starting in early July. This updates daily. Be sure to check that out too for an up to date picture! Indeed I am not the first person to think that betting on horses might offer some return potential. Earlier this year, I stumbled across a number of other financial independence bloggers that were having some notable success. Chief among these was TheFireStarter. If you are not familiar, this is a really well established UK-based personal finance blog of several years and I highly recommend you take the time to visit. There is some great content there and some very motivating results to inspire anyone on their journey to financial independence! In fact, the site, along with several others, inspired me to launch Pursue FIRE! So, sparked by their success, and having read further on the topic, it was time to start my own little horse betting side hustle! It’s important to stress that the strategy I’m going to discuss is pure gambling at the end of the day! Please bear that in mind and if its something you ultimately decide to try for yourself, please only allocate funds that you can afford to lose. I’d argue that, with a sensible staking strategy and appropriate risk management, that is unlikely to happen but it could (in theory). So proceed at your own risk! Please also note that this guide includes affiliate links to OddsMonkey. In my opinion, each way betting would not be possible without the brilliant Eachway Matcher Tool. If you are interested to try it out, please consider following the link. You can try the features out and OddsMonkey offer a full 30-day, 100% money-back guarantee if it’s not for you. In most corners of the financial independence community, ‘gambling’ would rank pretty low as a means to build wealth. Let’s be realistic – do I expect to make my millions betting on horses? Of course not. But if it can bring in a few extra bucks to pay down the mortgage or invest into funds, then I’m game. What is each way betting? Each way betting is a popular way to increase the chances of getting a return when betting, and is a very common type of bet in horse racing and in some other sports too, including greyhound racing and even golf! With an each way bet you are actually spreading your total stake across more than one outcome. So, rather than betting solely on a horse to win a race, we actually make two bets on the same horse; a ‘win bet’ and a ‘place bet’. The win portion of the bet should be self-explanatory, whilst the place part of the bet involves backing the same horse to finish within a predetermined number of positions in the race or ‘places’. Importantly, each part of the bet must be an equal stake (split 50:50). So, for example, if you placed a £5 each-way bet on a horse, you will have £5 on the win portion of the bet and £5 on the place portion of the bet, totalling a £10 overall stake. The each way bet will payout if either portion of the bet proves to be successful. If a chosen horse wins a race, both portions of the bet payout because the horse won the race and therefore, by default, also finished in the top positions. If the chosen horse does not win outright but finishes in the place positions, your bet will pay out on the place portion only. Needless to say, if a chosen horse fails to win or finish in the place positions, you’d lose the total stake, for example, £10. How Are ‘Place’ Positions Determined? The number of place positions offered in a race by a bookmaker will vary depending on a number of factors and this can not only vary from bookmaker to bookmaker, but also from one event to another. While it does not really change our approach to choosing the bets themselves, it is always worth knowing how many places are being offered when taking a bet. Place betting is not typically allowed on races with between two and four runners. If the race has between five and seven runners, place betting is typically available on the first-placed finisher, and also the second-place finisher. A race with eight or more runners will normally provide each way betting options that include the first, second, and third place finishers. There are also special rules that apply to handicap races when it comes to each way betting. The task of predicting the place finishes of horses in a handicap horse race is made considerably more complex by the fact that (in theory at least) every horse has an equal chance of winning the race. Because handicap races are therefore considered to be harder to accurately place each way bets on, bookmakers typically offer an extra placed finish as an option in each way bets on races involving 16 or more runners. For the vast majority of races in which I have had a bet to date, the first three positions (1st, 2nd, and 3rd) are the most common. How Are The Odds Compiled? Obviously, the odds to place in a race are going to be less generous than those to win the race as the probability of winning is less than the probability of finishing in the top few positions. The odds you see when making your initial selection are always based on the outright win. The odds to place are less obvious at the time of betting, but these are a fraction of the advertised win odds. Typically, all races will pay 1/5 of the win odds, except in all races of less than 8 runners, or in handicaps of 12 runners or more. For these races, the place payout is usually 1/4 the win odds. This can vary with bookmakers so it’s always worth checking when putting your bets on. Calculating the overall return potential from an each way bet is, therefore, a little more complicated as it involves combining the odds offered on the win bet and the place bet. Again, we don’t really need to worry about doing this ourselves, but I think it’s helpful to have a basic understanding. Right…. why don’t we summarise what we have learned so far by way of two examples. What follows are two recent bets from one of my own betting accounts; one where a horse wins the race resulting in both parts of the bet paying out; and a second example where the horse only places in the race, resulting in only the place part of the bet paying out. Hopefully, this will help bring these concepts to life. The screenshot below is taken from my Bet365 mobile betting app, one of several mobile betting apps I use daily. While each bookmakers app will be laid out slightly different, they will all generally follow a similar format and show the same information. In this example, the race in question was the 3:45 pm at Ayr on the 2nd October. I had chosen to place an each way bet on a horse called ‘Redarna’ at decimal odds of 9.00 for a total stake of £10. If you recall, our stake in a bet of this nature is split equally across both the win part of the bet and the place part of the bet at £5 on each. Again, the win part of the bet should be self-explanatory, but in terms of the place part of the bet, we can see that in this particular race, 3 places were being offered by Bet 365 (i.e. 1st, 2nd and 3rd positions) and that the odds for placing in those positions were offered at ¼ the stated win odds of 9.0. However, the ‘total return’ does includes our initial stake of £10 (£5 on each part of the bet). So in terms of actual profit should ‘Redarna’ win the race this would be £60 minus our stake of £10, leaving us with £50 of profit. Staying with Bet365, the next screenshot shows another recent bet I took. In this example, the race in question was the 2:30 pm at Sedgefield also on the 2nd of October. I chose to place an each way bet on a horse called ‘Ballyfarsoon’ at decimal odds of 17.0, again for a total stake of £10. As before, my stake was therefore split equally across both the win part of the bet and the place part of the bet at £5 on each. How To Pick The Right Horses? Now that we understand the type of bet we are looking to make, the different scenarios in which we might win, how the odds are calculated and what determines the number of places offered, the next obvious question is how to go about picking which horses to bet on! Don’t worry! You don’t need to know a shady guy down the pub or subscribe to the Racing Post ;-). I personally know nothing about horses other than not to stand behind one! So don’t let a lack of racing knowledge deter you from this endeavour. The horses we ultimately will choose to bet on will be handed to us on a plate via some clever software from OddsMonkey and their brilliant Eachway Matcher Tool. If you are not already familiar, OddsMonkey is a web-based piece of software that automatically finds the best odds for you, aggregated across all the different bookmakers, saving you precious amounts of time. There are other alternatives out there, but as I have only ever used OddsMonkey for this project, I can’t vouch for what other services might be like. In short, the Eachway Matcher Tool compares the prices offered by the bookmakers with those available on the betting exchanges (think Betfair, Smarkets, Betdaq etc) and highlights differences between the true odds on the exchange versus those available at the bookmaker. It then ranks this differential (i.e. expected value or edge) for us with all the information we need to take the bet with the specified bookmaker. You see, the place terms and odds offered by bookmakers are not based on probability. They simply either offer 1/4 or 1/5 of the odds (as we learned earlier) based on the size of the field or type of race. Prices for the place market on the betting exchanges, however, such as Betfair, are based on probability and are continually reflecting new information and are therefore true odds which lead the changes in bookmaker odds. So when the prices between the two move out of line it presents value prices for us to exploit with the bookmakers. Why Is The Exchange Price Relevant? Because bookmakers don’t like losing and will quickly ban or restrict the really shrewd punters, for example, horse race owners, trainers, and others in the inner circle with an intimate knowledge of the industry. Therefore, the only way to have a flutter if you are a shrewd punter is via the betting exchanges rather than the traditional bookmakers. When you place a bet with the bookmaker, it’s effectively you versus them, and in order to mitigate their risk, they will effectively take the opposite view. On the exchanges, punters can both back a horse to win (a back bet) and also back a horse to lose (a lay bet) – essentially playing the role of bookmaker by offering a price they are willing to lay a horse for another punter to back. This means that punters money is matched with other punters money. You think a horse will win and back it, someone else thinks that the same horse will lose and lays it. The exchange simply takes a commission and does not care one way or the other who is right or who is wrong. They have no skin in the game so to speak and because of this, no one ever gets banned from betting on the exchanges. Shrewd bettors are very much welcome and the volumes of bets via the exchanges can be significant! So we can assume that if the odds on a horse are shortening on the exchange compared to a bookmaker, there is ‘smart money’ driving that price down, thereby implying a higher probability of that horse winning or placing. Remember, the bookmaker place odds are not based on probability. In these scenarios, we will do well to pick up that horse at a higher price via the bookmaker. So back to our Eachway Matcher Tool for a moment! Imagine trying to crunch the numbers in this fashion manually? Could you really capture second-by-second up to date prices across hundreds of bookmakers, compare these to fast-changing prices on the betting exchanges, oh and calculate a gizzilion sums and probabilities in the process! I repeat I can’t see how this would be possible without this or a similar tool – it is a seriously awesome piece of software. As a result, it does come at a slight cost, but its worth every penny and our profits should easily accommodate the subscription cost. In my monthly reports, I always show the profits net of subscription costs and you will see that the profits dwarf the costs of using the tool. But before we get into the Eachway Matcher Tool in more depth, we will first need to get set up for success. You can’t place bets without having betting accounts up and running and funded with some cash. Luckily, I had several existing accounts from my other sports betting activities over the years but if you are starting out, I’d suggest opening a handful of accounts with some of the most established bookmakers out there – the likes of Bet365, William Hill, Ladbrokes and so on. Opening an account and adding some funds is a simple and quick process – it literally takes minutes. As a new customer, you may even benefit from some promotional offers, such as free bets or money back on your first losing bet for example. Each Way Betting can be done with a large variety of bookmakers and you can increase the number you use with time and experience. Starting off with too many however will only complicate things while you are learning the ropes so, initially at least, I’d limit this to 4-5 to get started. Once you have placed a few bets, you’ll be a seasoned pro at quickly navigating each bookmakers app to find the race and horse you are targeting and placing your bets with ease. In terms of how much money to deposit with each bookmaker – that is a personal choice. I’d first settle on what your total bank for this project will be and then act accordingly. Remember, this is gambling and you should only commit what you are prepared to lose. Needless to say, this should form a very small percentage of your liquid assets, especially at the beginning. My own personal decision was to commit £500 to each way betting. I then decided to adopt a risk tolerance level of 1% of my starting bank per bet – therefore risking £5 per bet (£2.50 each way stakes). Rather than having the entire £500 sat in bookmaker accounts, I decided to use half of my available bank to initially fund 5 bookmakers at £50 each (£250 in total), keeping the remaining £250 in my own accounts to fund other bookmaker accounts or top up the existing ones if required once I got started. So that’s £50 deposited with each bookmaker. At 1% total risk per bet (£5) that gives me sufficient cushion to get started. You don’t want to be topping up accounts every time you lose a trade as that would be very time consuming, so at £50 per bookmaker and £5 per bet (split £2.50 each way), it meant that I could accommodate 10 consecutive losing bets before the bookmaker account hits zero. This felt comfortable to me but you are free to follow your own path. OK, now that we have our bookmaker accounts ready and funded, we can go ahead and get our hands on without a doubt the most important tool that will enable us to screen for positive expected value and our qualifying bets. We need access to the Eachway Matcher Tool we discussed previously available from OddsMonkey. 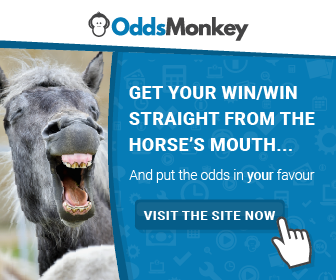 There are many more uses for OddsMonkey than each way betting, particularly if you enjoy matched betting in general, so the subscription is great value for money but for our purposes, we are only interested in the Eachway Matcher Tool for this guide. Once you are signed up with an account, sign-in and navigate to the Tools Tab, scroll to the Matchers sub-category and select the Eachway Matcher. At first glance, this may appear intimidating but rest assured it’s much simpler than it looks, and once you have used the tool a number of times it will become second nature. In fact, we are only really interested in a handful of columns, most of which are self-explanatory. While that sounds like a lot of detail, but we are only really interested in one column specifically and that is the Rating (%) column which shows you the expected value of the bet which is a combination of the expected value of the place and win parts of the each way bet. The next task is to apply some filters so that you only see the results relevant to the bookmakers you have opened accounts with. There are more than 100 bookmakers active within the tool so it makes little sense to clutter your screen with prices for bookmakers that you do not have active accounts with. Click on Filter button and, under Bookmakers, check the boxes for those bookmakers for which you have accounts up and running. Remember to save your changes so that you won’t have to repeat the process each time you log in! In the same window, we can also state what our preferred minimum odds and rating should be. At the bottom of the filter table, you’ll have the option to change these to your preference. So, aside from filtering the bookmakers, the only other settings I change are the Each Way Rating and the Back Odds. I personally do not wish to see ratings of less than 95% and I like my minimum odds to be at least 6. Why 6? because if only your place bet wins with odds of 6 you should at least break even. Think about it, if our each way bet fails to win, but places, those place odds are likely to be offered at 1/4 or 1/5 of the winning odds. So let’s say you have £5 riding on the place portion of your bet, based on a £10 total each way bet (the other half of which lost because the horse did not win). This would equate to place odds of 2.25 (at 1/4 odds) or 2 (at 1/5 odds). In these scenarios, our £5 stake would return us £11.25 or £10 respectively. Subtracting our initial £10 stake from the return would, therefore, see us eek out either a small profit of £1.25 or breakeven at zero for that bet overall. If the minimum odds were less than 6, let’s say 4.0, then this would equate to place odds of 1.75 (at 1/4 odds) or 1.6 (at 1/5 odds). In these scenarios, our £5 stake would return £8.75 or £8 respectively. Subtracting our initial £10 stake from the return would, therefore, see us make a loss, despite achieving a place position. For me, if a horse is going to place I want to at least cover my stake. I know some people happily accept odds below 6.0 but this is just what has worked for me so far. Again, these are just the settings I have found to work for me. You are of course free to adjust these to your preference. There is no set rule when it comes to setting your selection criteria for races, but I follow a fairly popular methodology to screen for suitable bets. If any of the following conditions are met, I’ll place a bet with the highlighted bookie as long as the quoted price in the odds column is still available with the bookmaker when placing the bet. You may ask why these combinations? The ratings in OddsMonkey are calculated including the commission rates with the respective betting exchanges. So, for example, Betfair Exchange charge customers a 5% commission on winning trades. Because we are not laying off our bets via the exchange, then a rating that is higher than 95% actually becomes >100% for our purposes. Anything over 100% means we have positive expected value in the bet and should take it. The commission is charged at 2% on Smarkets, hence the minimum 98% rating required. There is some excellent discussion on the OddsMonkey forums about different settings, but those stated above have worked well for me so far. All that is left to do is to sort the results by Rating (%) and enable auto-refresh so that the most up to date results are shown with the highest ratings at the top of the page. Let’s take a look at another screenshot to highlight some picks that I would make based on our criteria above. Here we can see a number of potential bets. All of the bets show a rating over 95% which is the minimum we need to see. From there, we can see there are a few horses that qualify based on our criteria above. In this example, I choose to bet on ‘Classical Milano’ which is priced at decimal odds to win of 8.0 with a number of bookmakers. His rating is over 95% and both the win and place exchanges show as Betfair so we have a qualifying bet. Keeping with our Bet365 examples in this guide, I jump onto my mobile app, locate the Hexham race at 3:25 pm, find ‘Classical Milano’ and double check that the odds of 8.0 are still available. From there, I just have to ensure I check the each way box at the foot of the bet slip after entering my stake, in this case £5. This means I have a £10 total stake, split between £5 on the win part of the bet at odds of 8.0 and £5 on the place part of the bet which will be at 1/5 of the win odds. From, there you repeat as required until you have a good number of selections for the day. I personally aim for at least 10 bets in a day. In the three months, I have been doing each way betting, I’m averaging around 12 bets per day. With potentially a dozen or more bets per day on the table, you will then need the means to capture all of the activity and analyse your results over time. Step forward my favourite spreadsheet of choice – Google Sheets. You can of course use whichever method suits you. I then have a series of connected sheets that take this data and summarise how the results are doing. I’m a bit of a data nerd, so I have charts and tables all fed and updated automatically from this one sheet. You may have already seen my monthly updates which break down my betting into different statistics I like to see. I also have my live results page which updates as I record bets. This is achieved by connecting my google sheet to Google Data Studio -a free data visualisation tool that is amazing! Periodically I will check the stats page to see how my profit is building and where the balance of my funds sit with the different bookmakers. It may be necessary to withdraw from one to top up another so that you don’t lose potential bets from a bookmaker where your balance is not sifficient to bet. As mentioned, you can realistically expect to see at least 10 qualifying bets per day, potentially many more depending on your settings and the number of bookmakers you choose to use at any one time. One of the most important things you should expect is that the majority of your bets will lose! When starting out this may discourage you at first, but stick with it and you’ll see that it is very possible to extract very good returns despite having such a small win rate! In fact, as at the time of writing this guide, I have completed more than 760 bets and turned a 116% profit (net of the OddsMonkey subscription) this despite 450 of my bets (58%) being losing bets. Multiple Screens – Between the Eachway Matcher Tool, the betting platforms and a spreadsheet your screen real estate can get crowded. If you are fortunate to have access to two monitors at work or at home this can really speed things up. Alternatively, the Eachway Matcher Tool looks great on an iPad. The number of bets per race – it’s important to be mindful of the number of runners in a race. Not only will this determine the number of places offered (which is obviously important) but it should also steer how many horses in a single race you may want to back (assuming the Eachway Matcher Tool is showing them). It’s fine to back more than one horse in a single race, but I’d limit it to between 2 and 4 depending on the size of the field and the number of places offered. So, in a race with 8 horses don’t back all of them just because they show up in the tool. In a large field backing up to 4 horses is okay in my opinion. Multiples – While I have not done many of these to date, you can combine each way bets together into multiple bets (doubles, trebles etc). The premise is the same but the payout on the bet is dependant on each bet coming good. These can offer very high return potential but are obviously harder to pull off. I’d recommend reducing your risk on these to 0.5%. Well done, you have made it to the end of this rather lengthy guide! Thank you for taking the time to read through it. While it may appear technical in nature, the actual premise and application of the strategy are very straightforward. I’ve tried my best to explain this is clear and simple terms, but if anything is confusing or you’d like something explained further please do not hesitate to let me know and I will update the guide accordingly. I’m so far into it now that its all become second nature, which can make explaining it to someone new potentially challenging, so let me know if you are stuck. I also plan to add a video showing you how I personally navigate the Eachway Matcher Tool in more depth and do a walk-through of a typical bet. I look forward to hearing about your successes in due course. Good luck! Excellent guide, thank you. I have been doing each wayarbing since July with a 21% return on £5 each way stakes. £1200 up. Cheers Alan – glad you liked the guide and I wish you continued success in the months ahead! Absolutely cracking guide (and blog in general). I discovered your blog whilst browsing the comments over at TFS’s blog and I’ve now saved this in my favourites to follow. I do have a couple of questions for you about Each Way Betting and how you personally approach it, so I thought I’d throw them in here so others can benefit too if you’re able to answer. 1 – You’ve mentioned minimum odds of 6.0, but do you have any criteria for maximum odds or is the sky your limit above 6.0? 2 – Do you have any criteria where the number of runners in a race is concerned? For example, “I will only bet on selections in races that have 12 or less runners”. Hi Rob and thanks for stopping by and commenting. I’m new to this blogging lark so comments such as these are a great source of inspiration to keep going! 1) As I lay out in the guide, I do go with a minimum of odds of 6.0 to ensure at least a breakeven should a horse with odds of 6 achieve a place. I know others may go lower, but 6.0 seems logical for me. In terms of maximum odds, I don’t have a set maximum. I’m guessing your question is really about determining at what level a horse essentially has no chance of winning or placing and does it still make sense to stake money on such long odds? If we recap that the OddsMonkey tool is presenting us with value bets, this implies that the prices are too generous on the bookmakers versus what is going on at the betting exchanges. For this to happen is mostly involves some volume of money going on that horse on the exchange to engineer a shortening of the price. If a horse has odds of 100 – it essentially has zero probability of winning and its probably common knowledge that its a major dud – so not smart money will be going anywhere near such horses. I have not seen a horse come up in OddsMonkey anywhere that price, but I do take them as high as 50-60 maybe more. Again, if the tool says there is the value I’ll take it, but in all reality, it will be very rare to see a ridiculous long priced horse show up with the kind of rating we look for. It can feel counter-intuitive to stake the same on a horse with odds of 60 as you will with a horse priced at 6. Clearly, one has a significantly greater chance of placing than the other, but if you believe that you should load up on short-priced horses and bet peanuts on the long priced ones. It’s too much guesswork and you’ll be jumping around with different risk per bets each time. Just take the value when you see it and stick to a disciplined risk budget and (over time) that pricing edge will bear fruit. Occasionally a long-priced horse will place and that can yield some of the biggest wins! 2) Regarding the number of runners – when I started out I would generally only bet on 1 or 2 horses max per race as a rule but as time has gone up I do sometimes end up betting on 5 or 6 on occasion. The key factors are the size of the field; the number of places offered and the presence of value bets. So In a large field of (let’s say) 16 runners, you’ll most likely get 4 places offered. If the OddsMonkey Each Way Tool spits out 4 value bets on that race, I’ll take them all and possibly a few more if the tool presents them. In these scenarios, I do prefer to have a good mixture of long and short odd selections (i.e. I would not want 4 selections at really long odds), but a good mixture I find is good. It’s like laying traps around the field and you are just hoping to nab a win or a place. Obviously, in a short field of 8 or less, 3 places will be typical (sometimes 2) so there is little sense in backing every horse so I might limit that to 1 or 2. In addition to taking these bets as singles, I’ve also been doing a lot more multiples (i.e. duplicating the same bets as double or treble selections) I do this at much-reduced stakes though as the probability of everything coming off is obviously less than a straight single selection. Hope that helps Rob and let me know if I can help with anything else. I look forward to hearing about your successes with Each Way Betting. Thanks for your answering. First answer makes perfect sense, as does second answer but it doesn’t answer the question I meant to ask, probably because I wasn’t very clear with my wording. It’s quite difficult to word the question without it sounding like I’m asking how many horses would you bet on in one race, but I’ll have another go. Let’s just say for examples sake that we only ever place a bet on one horse per race, just to remove that from the equation as it’s not relevant to my question really. So when you’re looking through the bets the Each Way Matcher is pulling out and it lists the number of runners in the race, do you have any criteria when it comes to a maximum number of runners in a race? For example, you might say to yourself “I will not place a bet on a race that has 12 or more runners in the race”, with the thought being that if there are more than 12 runners, your chances of hitting a win or place decreases as the number of runners increases. It doesn’t matter whether you’re baking one horse or five in that race, it doesn’t meet your criteria if there are over 12 horses running in it. The simple answer is no. I do not have any set criteria around the number of runners in a race in terms of choosing to bet in that race or not (even in a 1 bet per race scenario). I do not set the Each Way Tool in any way to filter out races by field size. I like to see them all and take the value when it’s presented. Do remember though that as the field size grows, the number of places does increase (not in a linear way of course), so you are compensated in some ways by the field being larger. But I’d also suggest that the probability of a horse winning or placing for us is driven more by its price than how many horses it is competing against but I see your point. But the probability for a given horse does not reduce (in a linear fashion) with the addition of another horse. (i.e. larger field). I guess this might be the case in the unlikely scenario where every horse was priced identically (and any additional horses also priced the same). Excellent. Yes that’s exactly what I meant. Thanks again. I’ll let you know how I get on. No problem Rob – best of luck with it! Good work PF. What strikes me is how similar your filter selection is to mine and how alike your and my spreadsheets are. I’ve been tracking my wagering informally for several years, I retired at Easter (relatively early) and decided then that it was time to start keeping proper records, devise a formal strategy and stick to it. Like you I maintain a central wagers table with a series of pivot tables hanging off it, breaking the bet history down by type, month etc. The main differences are that I calculate and show the win and place part of the bet (for no particular reason), and in addition to EW sniping I do some no-lay accas and follow a couple of tipsters, so I need to capture who recommended the selection plus the ability to process win-only bets. You do more dicing and slicing than me; I record the bookmaker but don’t track balances at that level. I can do that well enough in my head and I have a low and high threshold for each bookie, currently £50 and £200. If a bookmaker account falls below the low number I top up and if it goes above the higher I withdraw to an account dedicated to the purpose. Since mid-May, I’ve made 563 bets, generating a profit of £953 on stakes of £3879 (ROI 25%). The EW betting dates from mid August and contributed a return of £390 on stakes of £765 (ROI 51%) over 205 bets. I have been in the black every month bar one. As I started with a nominal £200 , my bankroll just breached £1100 (having a great November, up £384). This is good because I stake 1% of bankroll so my stake is now over £10 which means I usually qualify for some ‘free bet’ loyalty weekly offers (Coral and PaddyPower), giving a modest boost to returns. Hi Philip! It’s always great to hear others that follow a similar mindset! I live in spreadsheets pretty much, both in the day job and in terms of all things personal finance. In earlier versions of my sheet, I had both the win and place odds all automated (in terms of working out the profit, taking into account the number of places offered etc) so all I had to do was mark whether it was a win, place, loss or non-Runner. It worked perfectly but I found that the bookmaker returns would (fairly frequently) be out by a small amount based on things you can’t foresee, such as a horse dropping out and there being a Rule 4 deductions as the field size drops etc. In trying to make my sheet friendly for external consumption I just stripped out all the bits I rarely referenced or used – I figured this would be easier for others. Great to hear of your success. November remains profitable for me, but I’ve certainly given up a good chunk of profit in the last week – without the doubt the worst run of days I’ve had since starting, but can’t complain. Profit is still profit! You have an awesome ROI! In my other betting and sports trading days, I always considered a long-term ROI of anything over 10% quite impressive. Mine has taken a knock of late but still running in the low teens. Writing to thank you so much for this post! We had started matched betting recently but had also seen how much success folks like SavingNinja and yourself were posting about each way betting. This post you made really helped break everything down into rules, process and strategy (which certainly suits my preferred style), enough to convince me to make a start. Brief background too – I was recently made redundant. We had been toying with aiming for FIRE for a year or so, starting to think about cutting back but monitoring our spending more carefully. I hadn’t really shifted my mindset though until the redundancy came along. So, alongside days at home now looking for jobs, the side hustle has started! I decided to spend a couple of days practising the each way process without placing any bets so that I could get the hang of it, and using your excellent spreadsheet. I’m on day eight working with real money. I’ve found that I place my first 3-4 bets 9am – 12pm, then dip in to add during the next three hours to see how active betting is affecting the table. So far I have a cumulative ‘profit’ of -£58.60 from a total of 80 bets, of £4 each. I have kept referring back to your post to check my logic matches, but additionally being able to reference your actual results spreadsheet too has helped keep me sane and encouraged. Already, with my semi-statistics background, it’s proved fascinating to see how things are shaping up. Looking forward to so many more data points to help me refine my approach, and of course the expected positive impact that will have on results. Curious to know how you manage to find 12ish horses to back between 9am and 12 pm? Hi Mark and thank you for your kind words about the guide – I’m glad you have found it a useful resource to get you started. I seem to be getting quite a few questions about finding bets. Everyone will see different results of course dependant upon which bookies you are screening bets for, what settings you choose to use, what stake you are betting at etc. Some days a certainly quieter than others but most days I find at least 10 bets between 9-9:30am and 12pm. Like you, I may sometimes dip in again later if time permits to pick up another odd bet here and there. Today, for example, I had 13 bets logged within the first hour or so of looking. I’m using about 8 bookmakers right now and my approach is to leave OddsMonkey up on my iPad while I’m working and I just put the bets on when they come up. Hope that helps Mark! Cheers Jim McG and welcome to the group on Slack! Love this blog thank you so much for taking the time to do this – great info for those following in your footsteps. Do you do the arbs – over 100%? I’ve stayed clear of those but within the first week have already been stake restricted by two bookies – how have you managed to keep your accounts healthy? Hi Bob. Thanks for your question. I personally would not advise placing multiple bets on the same horse across different bookies. The win ratio is actually very low in EWB (I average about 10% wins), but with the right staking and risk management that is all you need to make seriously good returns. I can see the appeal of hoping to catch a winner and getting paid multiple times but for me the risk:reward does not stack up. If you choose to do it, I’d advise lowering your stakes for each bet accordingly so that you are not exceeding an overall risk on that horse of 1-2% of your bank. If you did 1% per individual bet say 6 times across different bookies, and that horse does not win or place, that’s 6% of your bank blown on what outcome. It would also depend on the odds. Would you feel comfortable loading up multiple bets on a 41.0 shot in the hope of winning big? I know I would not but each to their own. Just watch your bank. I think success in this (or any betting) is about managing your downside more than anything else. Good luck! Hi – thanks for the taking the time to write the guide! A quick question (I may be missing something obvious), but in your example above you took the bet on Classical Milano when there were other runners that met your criteria; namely Shaiyza or Dandy Highwayman. Was there a reason for that or would you also take those bets? Hi – thanks for taking the time to write the guide! A quick question which might be really obvious, but there seems to be other runners in your example that met your criteria – namely Shaiyza and Dandy Highwayman, which appeared to provide ‘better’ value. Was there a reason you didn’t select them? Hi Dan, great guide and really interesting topic! I’ve been into matched betting a while and have worked in the financial betting/trading markets previously, so I’m always interested in the numbers and the ‘house edge’. Fixed odds/sports betting isn’t my forte, but my understanding is that bookies will make the odds such that the sum of the probabilities of each horse winning is >100%, and so this is their ‘edge’ and they keep the difference between that figure and 100% to ensure profit over the long term. I also then understand that the interesting/profitable thing about EW betting is that the odds you can bet on are derivatives of the winning odds, rather than configured specifically to predict the exact probabilities of horses placing, nor to maintain the house/bookie edge. Where my maths/logic gets a bit hazy is whether one can add up the odds of the EW bets and see if they add up to less than 300% (if the top 3 positions qualify as placing)? My thinking is that your guide above is focussed on betting on odds that are better at bookies compared with exchanges, but this doesn’t necessarily mean they haven’t maintained their house edge (i.e. the sum of the EW bet probabilities might be >300% still). I wonder, therefore, if there’s something in working out the total probabilities of the odds, and whether you’d get a better ROI on those instances where the sum of the probabilities are 300% and the bookies are effectively giving up their house edge? Great question Muggins! Essentially yes, the bookmakers do ensure they pocket by working to what I think they call the ‘overround’. You are also correct, that EWB is built on the premise that when the odds for a horse to win are shorter on the exchange than they are with the bookmaker, then ‘value’ is offered to the bettor. So, just because there is a differential between exchange and bookmaker, you are right that (in the eyes of the bookmaker at least) they still maintain their overround as all their prices in a given race, will be automatically calculated as such to ensure >100%. I’ve not considered your last point before, nor how to go about doing so but its something I’ll have a think about! I’ve not heard of ‘overround’ before, so thanks for teaching me the term! My brain might be going a little fuzzy now, but thinking about it, I wonder if the overround for the sum of the EW bets is <300%, does that mean if you place an EW bet on all the horses you're guaranteed to make money…? Obviously you'd get gubbed pretty quickly, but does the maths work…?